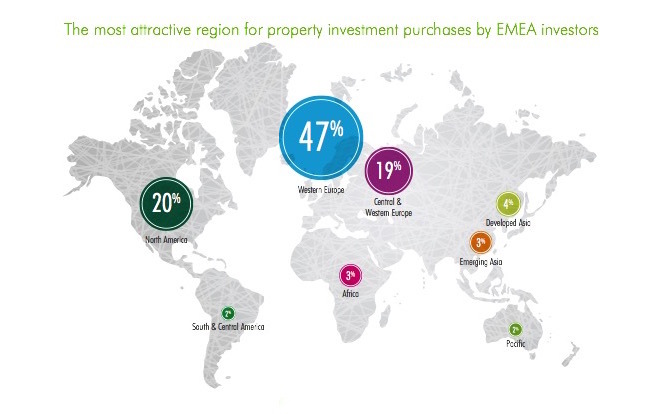 There were 423 responses to the 2016 EMEA CBRE online survey of investor intentions requested, by invitation only, from our client list across the EMEA property investment community. Comparisons with the 2014/15 surveys suggest that, while investor demand will remain strong in 2016, the ‘froth’ is coming off. Although on balance investors told us that they plan to invest more this year than last, that positive balance has shrunk considerably. The stand-out finding in the 2016 survey is how much more widely investors are looking across the region. Asked which country they thought most attractive for investment, 42% of respondents picked the top three countries (UK, Germany and Spain). In 2015 that statistic was 61% and in 2014 these top three choices accounted for 70% of replies. This is also evident in the cities that investors think are most attractive for investment. Between them, our respondents mentioned 53 different cities, and the concentration of responses is far less pronounced than in previous years. The changing economic background in Europe probably accounts for this changing pattern, with a more broadly based economic recovery recently becoming established. Also evident is a significant improvement in investor sentiment towards Central & Eastern Europe (CEE), with a big increase in the numbers picking CEE countries as the most attractive country and CEE cities as the most attractive city. It looks as though pricing may be the driver for this. H2 2015 saw prime yields in continental Western Europe fall very sharply, converging with earlier falls in the UK. This has left behind yields in CEE markets and the yield gap between CEE and Western Europe has increased markedly. The search for yield also shows through in sector choice, with 56% of our respondents already invested in one or more ‘alternative’ sectors and 57% actively looking in one or more of these sectors. However, investors are not all that eager to move up the risk curve. Given the turmoil in equities markets in the first couple of months, this is not all that surprising. It certainly showed through in that 31% think that the global economy poses the greatest threat to EMEA property markets, well ahead of the second highest choice, the domestic economy on 14%.